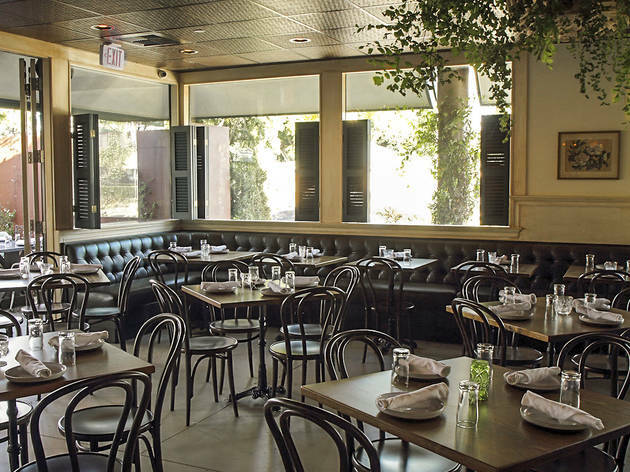 Outstanding meat dishes abound at this Southern-inspired restaurant in Culver City. 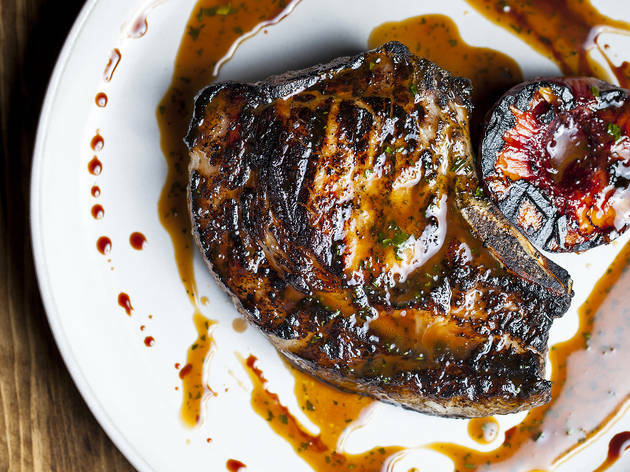 A must-try: the wood grilled pork chop. 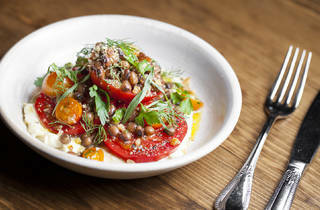 There are plenty of places to eat a vegetarian meal in LA, but Hatchet Hall is not one of them. What gives it away? 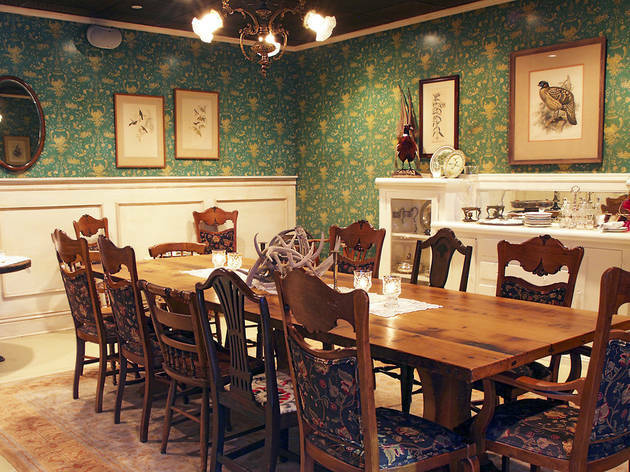 Subtle things, like the vintage photos of quail lining the wall. Not-so-subtle things, like mounted hatchets and a menu that doesn’t list a single entrée without some kind of meat or fish. And then, more in-your-face things, like said menu sporting an illustration of animals hunting, most notably a goose chopping the head off its brethren. So if you are a vegetarian, or just not that into meat, don’t come here. 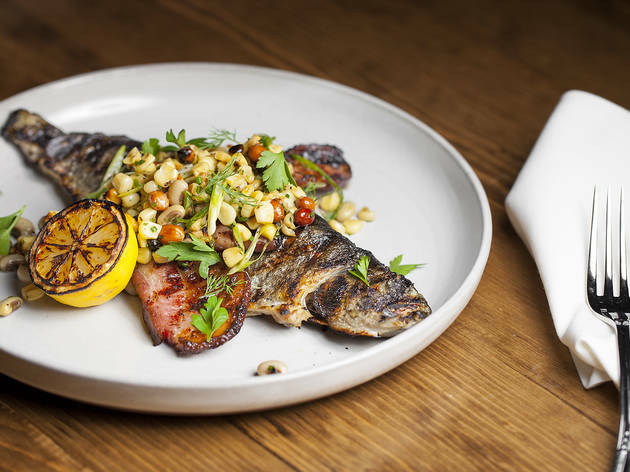 But if you enjoy a good steak or pork chop or slab of fish—this might be your new favorite restaurant. 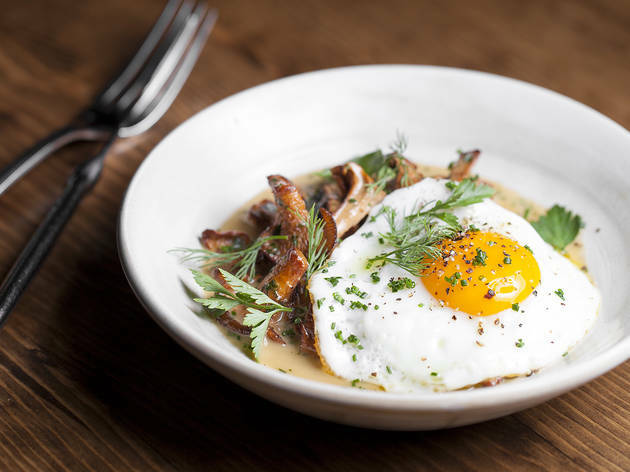 Chef Brian Dunsmoor (The Hart and the Hunter) has created a love letter to rustic American cuisine at Hatchet Hall, with an environment and menu that channels a relaxed, beautifully curated Southern vibe. 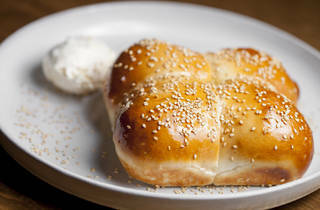 Take, for example, the benne yeast rolls, which arrive four to an order and come with luxurious honey butter that I could have eaten by the spoonful. 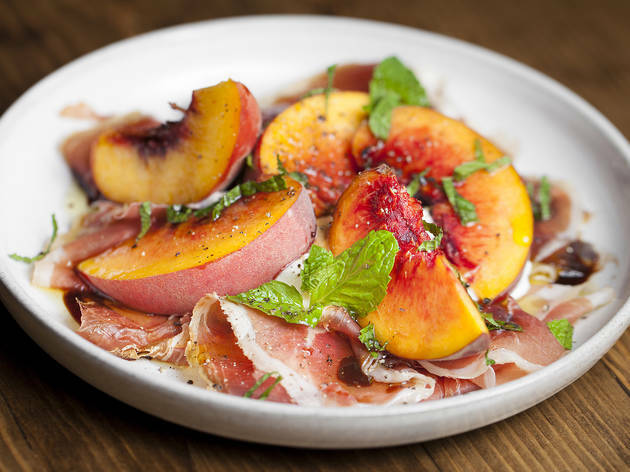 Or the plate of just-ripe melon from Weiser Farms, presented on a tangled bed of fatty, Mangalista ham and sprinkled with mint. These are all dishes you have seen before, and yet Dunsmoor and chef de cuisine Jack Leahy seem to have perfected them completely. 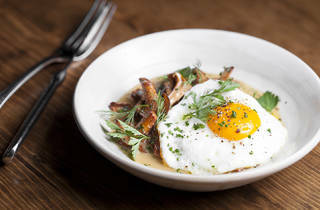 In writing about restaurants, I thrive on branching out of my comfort zone. Crickets? Stinky tofu? Sure! And yet, some dishes are often ignored. I rarely order pork chop, because more often than not it is dry and overcooked, and not the easiest slab of meat to finish. So I was astounded by Hatchet Hall’s wood grilled version, the best pork chop I’ve had in a very long time. The pork is from Peads & Barnetts, which sells its heritage meat at the Santa Monica farmers market, and the quality meat combined with a bite of blackened peach—everything drizzled with fig and brown butter maple jus—has restored my faith in this dish. 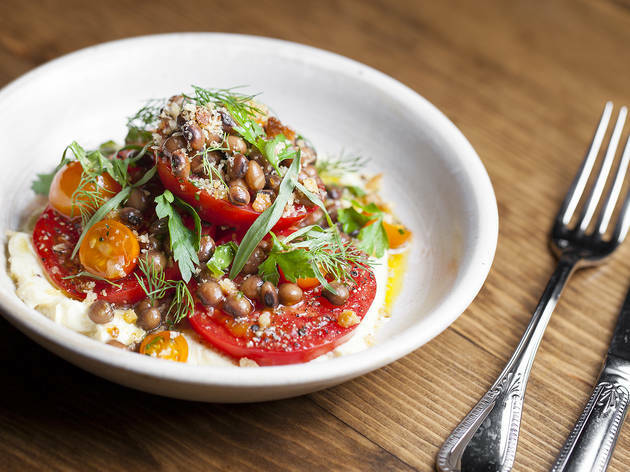 There are seafood options, like a whole crab that you may spend more time deconstructing than actually eating, and hearty sides, like sweet corn succotash tossed with green chickpeas, cherry tomatoes, cream and mint. 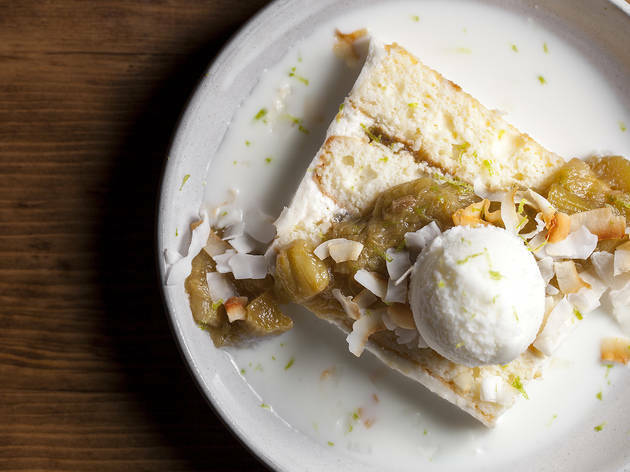 There are fantastic desserts, too—a coconut cream cake with rhubarb and homemade coconut lime sherbert exhibits a beautiful combination of textures, and is a delightful way to end a meal on a hot summer night. 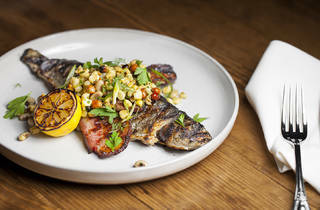 But above all else, come for the meat: the chicken liver and the lamb sausage, the rabbit and the wood grilled octopus. And, oh man, that pork chop. 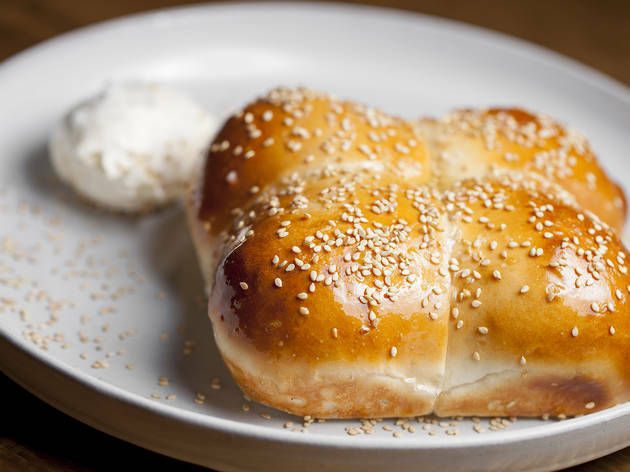 What to Eat: The benne yeast rolls ($6). 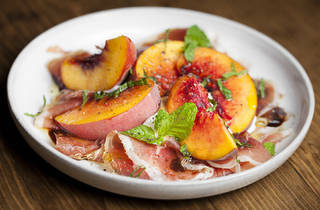 The melons and Mangalista ham ($15). 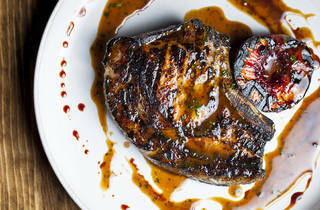 The pork chop with burnt peach ($38). 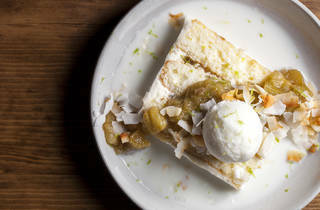 The coconut cream cake ($11). 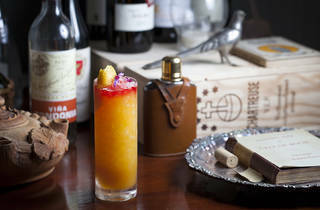 What to Drink: Before ever stepping foot inside Hatchet Hall, I was already looking forward to the restaurant’s cocktail list, an inventive collection of drinks designed by head barman Cappy Sorentino. 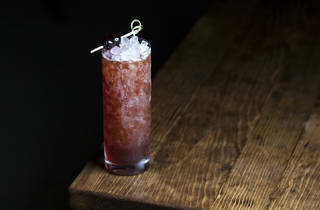 More specifically, I had my eyes set on the root beer gin & tonic ($12), a drink that combines two of my favorite beverages. Unfortunately, sometimes two rights don’t always add up. 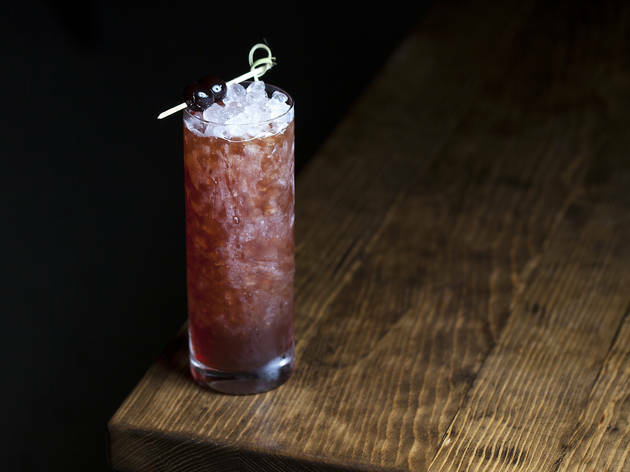 It’s a strange cocktail, and one that takes patience (and a predisposition towards root beer) to get used to; I had to soldier my way through the strong medicinal taste until the flavors started to even out. 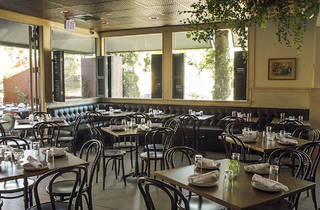 Diners that are not so patient should probably stick to standards like the New East Side ($12), or maybe just the wine list. 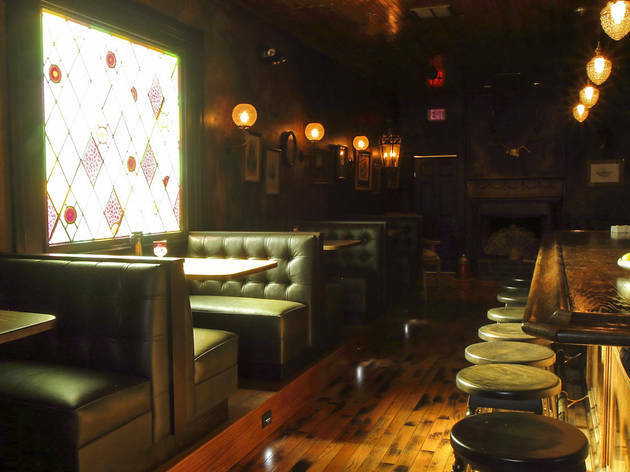 Where to Sit: There’s a place for everyone at Hatchet Hall: a seat in the dining room, where you can choose from communal tables or smaller, more intimate tables and booths; on the tree-flanked outdoor patio; at the small oyster bar; or, if you’re just here for a drink, at either the elegant bar at the front of the room or the Old Man bar that opens at 8pm. You have choices, and it’s a beautiful thing. A good date spot because everything is meant for sharing! And tasty! 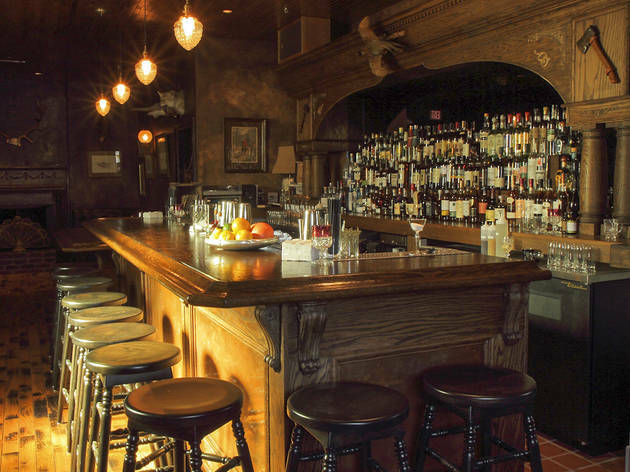 The old man bar has a lot of interesting cocktails! Great ambiance! Make a reservation cause it can get busy! A little bit of snooty hipster vibe, but I can get over that for all the wonderful flavors! 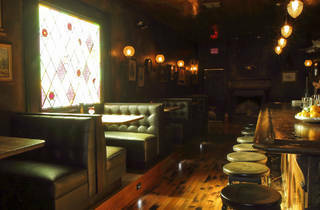 Incredible ambiance with perfect chill lighting. 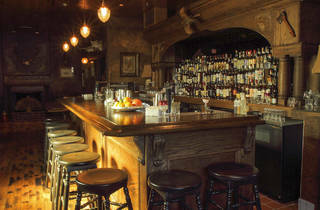 Just when you've had your fill of perfectly crafted cocktails and savory bites, there is yet another world to unpack in the old man's bar attached. 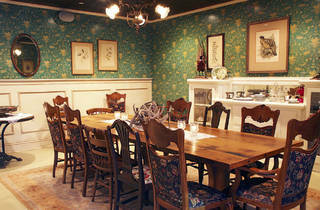 Girl's night or date night, Hatchet Hall serves up memorable evenings. 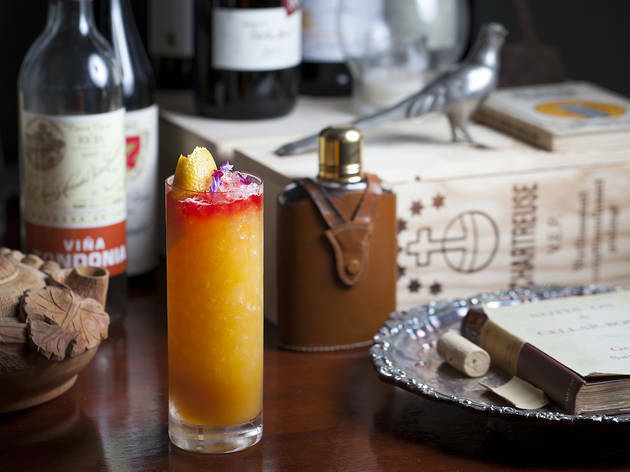 Secret- go early, before millennials- eat great food - enjoy good drink before the craziness begins! This Brian Dunsmoor clearly knows his way to your heart. I mean, he keeps it SO simple it hurts, and still ( spoiler alert green friends:: i am about to talk meat), his deer tartare surprises you with the flavor of pine nuts right the second where you thought it was just a tad too raw, his chicken liver crostini made me cry ( yes I love food but also my mom's from Venice, and that first bite sent me to biggest 'fegato alla veneziana ' trip ever, and I got emotional and all, so now you know I am not exaggerating anything ), and his wine selection is, obviously, impeccable. I am glad Abercombie & Fitch isn't showing young adults' torsos anymore by their entrances, so that the Hatchet Hall could hire them all to bring you the one thing I find rather cheap and greedy. Let me first say that this is NOT a cheap place to have dinner. If you like good wine, in spite of the water epiphany you just had, you might wanna sip a glass or two. This said, you won't pay less than sixty dollars. So, finally, WHY? Why? Why presenting me with the difficulty of wondering where the heck is the bread ( I am a stubborn Italian who would eat her spaghetti with a nice baguette), and then chill me with a six-dollar mini basket of what I call fluffy-and-a-little-pretentious-hawaiian-dinner rolls ( motherly called YEAST ROLLS), when all you wanna do is keeping it real? And because you're so good at that, you might as well drop that 'bread tax' and have the Abercombie stud deliver some crafty loaf GRATIS ET AMORE. Cheers to monsieur Dusnmoor, though. Holy moly, I can't say enough great things about Hatchet Hall. Every dish was absolutely perfect and excitingly memorable .The pork chop is easily one of my all time favorites and completely changed what I thought a pork chop was capable of.